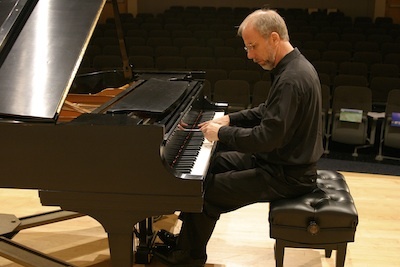 The 2006–2007 season was the first time we presented five concerts, and we began with the fabulous pianist Lynn Raley. He opened his concert by alternating Brahms's Piano Pieces, Op. 119 and Schoenberg's Piano Pieces, Op.11. 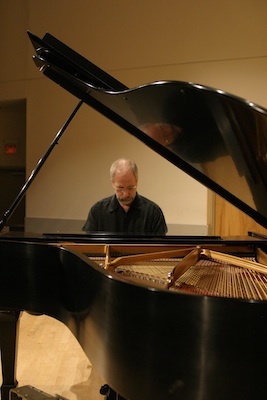 The main part of the program was Charles Wuorinen's The Haroun Piano Book, written for Raley and based on Wuorinen's opera Haroun and the Sea of Stories (which is itself based upon the novel by Salman Rushdie). The exciting program concluded with Karlheinz Stockhausen's Piano Piece IX and John Zorn's wild Carny. 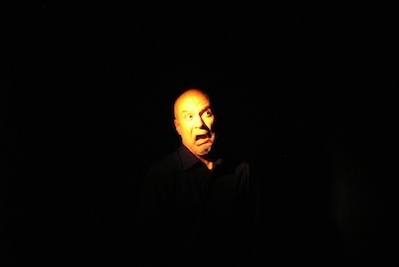 NMNC Director Stephen Miles gave a thrilling solo performance of three works that used voice, gesture, movement, and lighting to different ends. The concert opened with Vinko Globokar's disturbing ?Corporel, for a percussion player on his body. Using his hands, his face, in fact his entire body as an instrument, Miles evoked a prisoner, perhaps a victim of abuse or even torture. Performed with bright lighting, this thrilling piece was contrasted by a dark yet equally moving work by Francis Schwartz, The Death of Garcia Lorca. Miles began this piece in total darkness, and only after an eerie electronic track played softly for more than a minute did a single light reveal his face—twisted in agony. 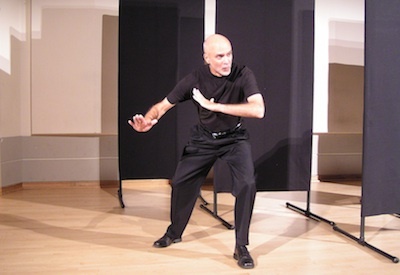 Miles used his face, his breath, his voice, and his hands and (as in many of Schwartz's works) encouraged the audience to join him in breathing and sighs. This moving piece ended as he bent over and covered his head with his hands, and the lights dimmed once more. The final piece of the program was decidedly more upbeat: Miles's own The Anatomy of Gesture, written expressly for this concert. Beginning at the rear of one of the aisles, he progressed onto the stage, across, and eventually up the other aisle, transforming his physical movements and vocal gestures as he travelled. The piece is a structured improvisation, with over twenty specific gestures but much latitude in their execution. It was welcome release coming at the end of an intense concert. 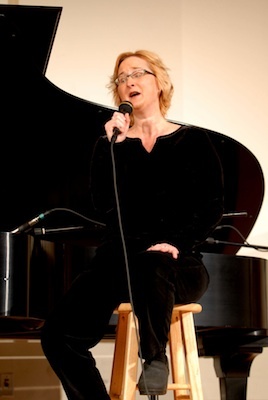 Mezzo-soprano Jacqueline Bobak came to NMNC to perform vocal works all based on texts from American poets. 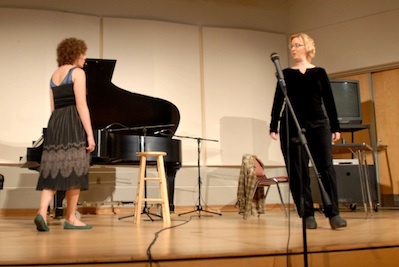 She opened the concert with help from New College student Amber Vistein; the two circled each other and sang James Tenney's A Rose Is a Rose Is a Round, with text by Gertrude Stein. Then, accompanied by Genevieve Beauchamp on piano, she performed Mark Bobak's three poems based not only on e.e.cummings's text, but also on his unique typographical arrangements. John Cage's expansive Song Books came next, with Bobak using audio and video playback, props, and of course her voice to illustrate texts and concepts from Henry David Thoreau. 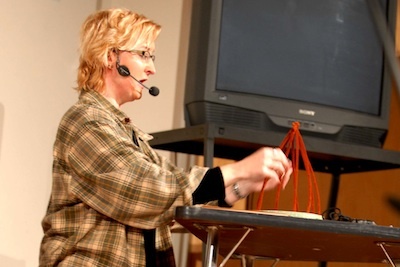 The Song Books have been performed a number of times at NMNC—they were in fact our very first concert—and each performance brings out different aspects of the many themes embedded in this wondrous work. To end the evening Bobak performed Daryl Runswick's Lady Lazarus (with text by Sylvia Plath) and William Brooks's Medley, based on a Gertrude Stein prose poem and sung in several contrasting vernacular musical styles. Composer and polyartist Francis Schwartz led a group of New College students in a two-month odyssey, exploring the processes of making and performing music. The nineteen members of the New College Student Collective—Carolyn Baker, Harrison Bender, Alexander Cline, John Ewing, MAtt Goetke, Erica Gressman, Kotu Hell, Nick Lucas, Alexander "Fuji" Salisbury, Jimmy Schaus, Justin Speed, Sara Stovall, Jasmine Turcotte, Geoffrey Vitiello, Kim Vorperian, Allie Weiss, Tyler Whitson, Evan Williams, and Bill Yanelli—constituted a group ISP, or Independent Study Project that, directed by Schwartz, created a new experimental piece about the limits of communication. The concert opened with Schwartz's Paz en la Tierra (Peace on Earth), composed in 1972. Structured but allowing considerable performer freedom, the piece has the chorus move throughout the audience space and invite the audience members to participate. The second half of the concert was the Collective's creation Communications Omelette. Born collectively out of the students' preconceptions, frustrations, and insights about the ability for humans to communicate with one another, Communications Omelette had performers working with and against each other to transmit their vocal gestures. Three members of the Florida West Coast Symphony (now the Sarasota Orchestra) graced NMNC to close our first five-concert season. Lydia Van Dreel on horn, Jonathan Spivey on piano, and Daniel Jordan on violin gave phenomenal performances of Brahams's Horn Trio and György Ligeti's Trio for Violin, Horn, and Piano (1982), which Ligeti composed as an homage to Brahms's classic composition.